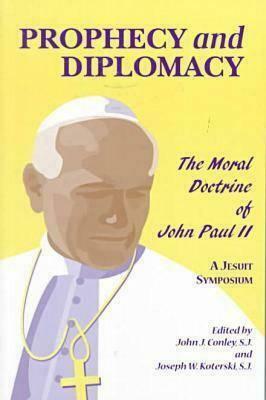 Stemming from two conferences, held in 1994, and 1996, Prophecy and Diplomacy: The Moral Doctrine of John Paul II explores the general orientations and the specific applications of the moral teaching of Pope John Paul II. The first part of the book places the Pope's moral theory within a broader theological framework, attempting to identify the overarching philosophical and theological attitudes that shape the Pope's fundamental moral perspective. In part two, the work studies the Pope's teaching in the areas of applied ethics. Both the major lecturers and the respondents focus upon those areas of applied ethics that have provoked the greatest tension between the magisterium and the academy and between the Church and the state in the West. The volume concludes by presenting a homily that places the ethics of John Paul II within a spiritual framework of repentance and redemption. The Pope's moral teaching is not an academic survey of ethical themes. Nor is it a Pelagian call to human self-regeneration. The ultimate truth concerning human conduct and moral judgement emerges only with the proclamation of God's grace.